Share the love with this splitter adapter with dual volume control. This compact device conveniently allows you share your favorite music with a friend. The dual volume control makes it easy for both parties to listen to music at their own preferred volume levels. With painstaking attention to audio performance, the iCB110 was designed for optimal acoustic delivery. 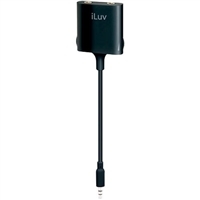 iLuv ICB21 Premium Charge/Sync Cable For iPhone, iPod, iPad. Compatible with all Apple devices with the 30-pin connector. With painstaking attention to audio performance, the iCB117 was designed for optimal acoustic delivery. It functions as more than a simple connection for a digital audio device; it's a quality extension of it. Keep your Apple Lightning devices charged with the High Quality Lightning Cable. 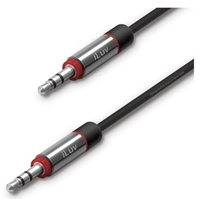 This 3 ft. long cable features a durable connector and cord. The High Quality Lightning Cable is compatible with all Apple Lightning devices, such as the iPhone 5s and the iPad Air. A 3 ft long Apple-certified lightning cable with micro USB can charge and sync almost any USB device, such as smarpthones, tablets, e-readers portable speakers, Bluetooth headphones, and wearables.